This voucher is valid for one adult admission and is to be surrendered at the cinema box office for a ticket to the session of your choice. As seating is limited and a reserve seat policy exists it is recommended that a booking is made prior to the redemption of the voucher by telephoning or booking online (Village Cinemas only). Phone booking fees apply at Event Cinemas. Once the voucher is used to book a Gold Class seat, there will be no refund if the seat is not occupied and the voucher cannot be used for another booking. At all locations patrons must be 18 years of age or older to purchase alcohol. Identification will be required. 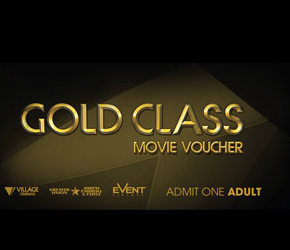 The voucher is not valid for movie marathons, group bookings, special events or in conjunction with any other offer or promotion unless otherwise stated. A surcharge applies for 3D/Real D films. It is the responsibility of the holder to use the voucher before the displayed expiry date. Expired vouchers will not be extended or replaced.